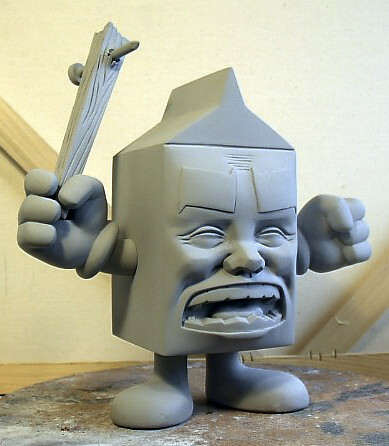 Milk and Cheese vinyl sculpts are go! 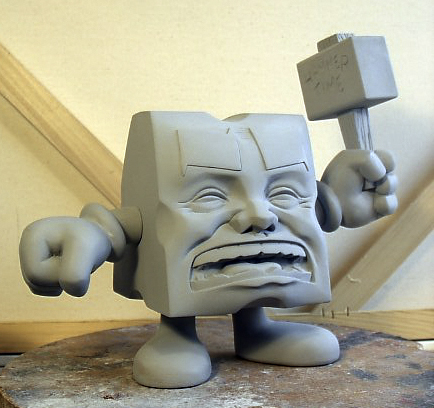 Here at last are photos of the final Milk and Cheese vinyl sculpts by Mitch Martinez. We're really happy with them and hope you guys like them as well. If all goes according to plan, SLG will be getting these out in July or so. Start saving now! hey guys, Sarah here with a link to Evan's flickr photostream; I've battled our sucky connection and successfully uploaded a bunch more photos of the sculpts, including a nice shot of all three weapon accessories. 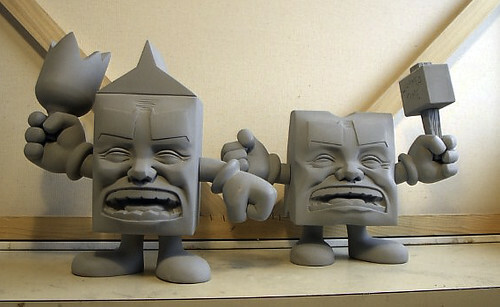 They are a set, Milk + Cheese + 3 weapons; I can't remember the height but I'm thinking about 7-8". And the treads are there on the bottoms of their shoe-feet, there's just no photos of that. Evan'll be back to answer everything else after he's done digging us out from under the tons of snow we got today. Glad everyone seems to like them, it was rough getting them just right but we really felt like we did! Next up is coloring them and designing their box -- yikes!